A gentleman came to Knutson in search of a custom desk for his new office. His main request was that he wanted to stand all day while working, but he also didn’t want this desk to look like something you could just go buy off of the shelves at a store either. He wanted it to be unique and more of an art piece for his office. 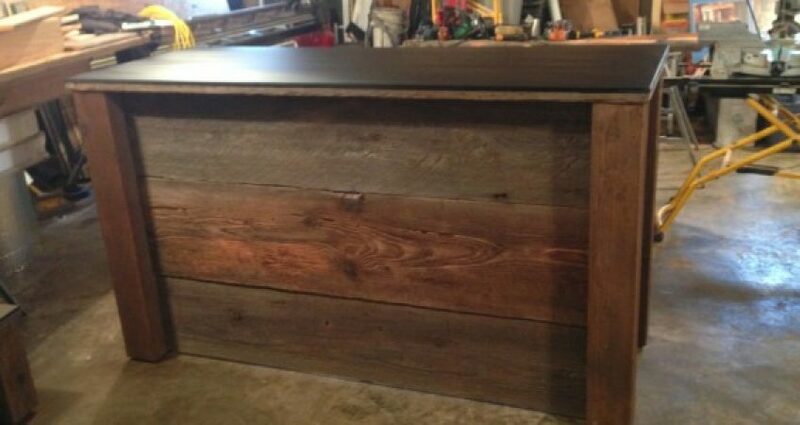 Knutson was able to gather some 100 year old local (to Duluth area) reclaimed timbers to use for the base of the desk. The grain on these timbers are some of beauty created by the ants living in the logs. The desk top is a piece of Richlite which is from a company called Loll Designs, also a local company to the Duluth area. There was enough timbers and Richlite for Knutson to also make this gentleman a lovely coffee table to match his new desk. We feel the desk and coffee table will be 2 pieces of artwork for his new office.